This piano accompaniment matches the key, tempo indications (with metronome marking), articulations, dynamics, measure numbers, etc., used in the Solo Flute part in Vivaldi’s Concerto in D Major (RV 427, Fanna VI, No. 3, Pincherle No. 203). 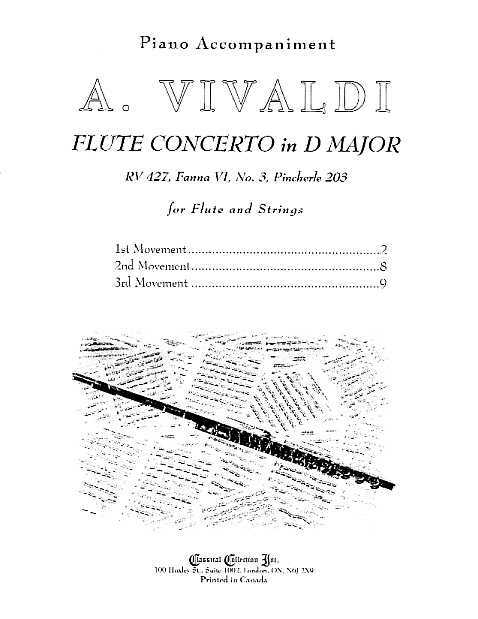 Visit Vivaldi Flute concertos for details on the history and background of Vivaldi and his Flute concertos.